In early September, Hurricane Hermine swept into Florida and delivered eight manatees to a golf course pond in Crystal River after a nearby Kings Bay canal was flooded. When the flood waters receded, the manatees became stranded in the pond. Staff at the Plantation golf course reported the manatees to the Florida Fish and Wildlife Conservation Commission (FWC). The pond was full of hydrilla, a favorite food of manatees, so there was no worry that the manatees had enough to eat, but it was important to capture the stranded mammals and release them back into their natural aquatic environment. On Thursday, September 15th, coordinated by the FWC, about 100 people worked to help capture the manatees and release them back into Kings Bay. Staff and volunteers from many groups, local businesses, and agencies participated, including Save the Manatee Club, the U.S. Fish and Wildlife Service, Crystal River National Wildlife Refuge, USGS Sirenia Project, University of Florida, Clearwater Marine Aquarium, and Tampa’s Lowry Park Zoo. 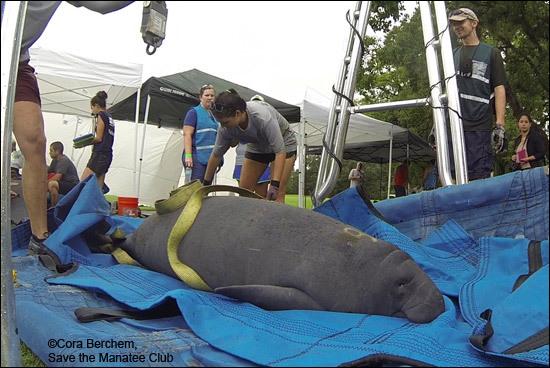 “It was a HUGE team effort,” said Save the Manatee Club’s Cora Berchem, who participated. “We assisted with spotting manatees, setting the net, pulling the manatees on land, getting them on the stretcher, getting them on the trailer to transport for a health assessment, and releasing them back out into open water.” Kayakers and people stationed in the pond also helped out by slapping the water to drive the manatees to a capture area. Three of the manatees captured on Thursday were females with calves, and all four of the adults have been known to frequent the Crystal River area. An eighth manatee was captured and released the next day. Many thanks to all who put in long hours on an often rainy day to help out on the capture and release of the stranded manatees! One of the manatees is weighed as part of a health assessment prior to being released.